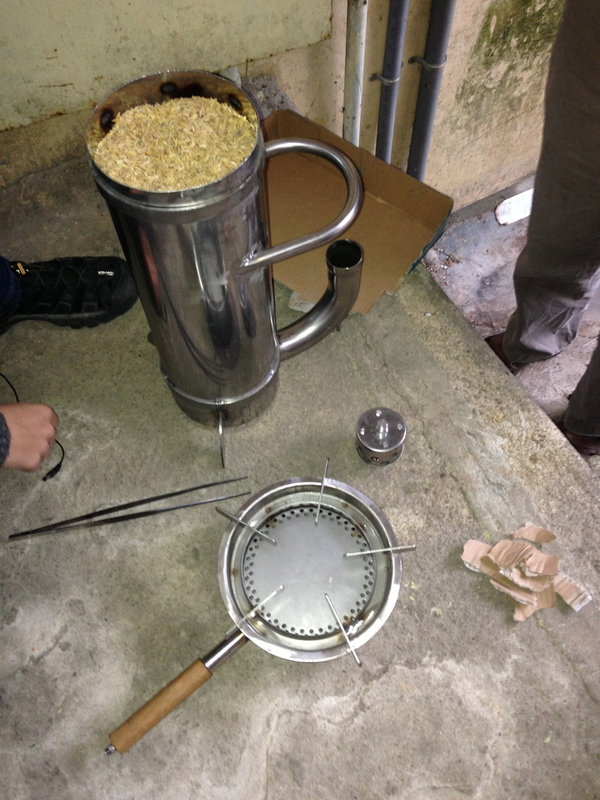 When I was asked if I wanted to witness Professor Paul Olivier's newest invention, an under-$50 micro-gasifier, I was immediately intrigued. His mission is to bring an affordable, sustainable, emissions-free cook stove to farming communities that closes the agricultural waste loop. Not only does this stove use a readily available waste product (in Asian communities, rice hulls tend to be the most abundant), but the biochar that it produces is more valuable than the rice itself! The Japanese market is already on this, and wants more than is currently available, currently paying $1 per kilogram, which is a little more than the cost of white rice in a typical market. Meeting Professor Olivier was a treat. A Master of Philosophy, all-around tinkerer and technological problem-solver, Paul (as he prefers to be called) is working on a number of projects with Đà Lạt University's Agriculture and Biotechnology Department. About 20 years ago, he developed a machine that combines clay with water to separate root vegetables by density (with an accuracy to the third decimal point! ), which has become the norm in many European countries' food processing industries. This could have a huge impact on coffee wet-processing, and could make dry density tables obsolete (as dynamic-movement density sorting is not nearly as precise). For some reason, Vietnamese red clay is proving to be the best for this application. We start experimenting with this concept later this year, as harvest begins to ramp up in late summer-early autumn. Paul worked with the Vietnamese military to manufacture the gasifiers from stainless steel for a very good price. Mass production, of course, will bring the cost down significantly, so we all hope that this idea takes off in Asian farming communities. Operation and power are extremely simple, and we learned how to use it with just one half-hour session. Fill the cylinder with dry organic waste product - rice hulls are easy and free to procure, though corn husks and stalks, dry coffee cherries, grass or a number of other available materials are suitable. Cardboard pieces are good to initiate the process. Simply create a good flame directly on the biomass until the top is evenly lit. Once the biomass is lit, remove charred cardboard or kindling and place the fan on the airflow tube. The fan is a small computer cooling fan (~5W) that can be run from a full mobile phone or motorbike battery. My mind immediately went to micro-solar panels, which would pair nicely with the gasifier as a development/aid project. Place the stove burner component on top and light the gas. Turn on the fan and watch for a blue flame. As the gas is produced from lower points in the biomass (the metal will change color as this happens, so is easy to monitor), increase airflow. A full cylinder will give anywhere from 30-45 minutes of continuous high-heat fuel, depending on how compacted the biomass. Remove fan and stove burner components and empty chamber (carefully, as the biomass is very hot, and un-gasified hulls are still combustible - this heat can be contained in a clay pot to keep food warm). Paul has been experimenting with the biochar and has found it to be a remarkable additive to compost, animal feed and bedding, among other things. For compost, it helps to balance pH and creates a lovely home for beneficial anti-bacterial fungi inoculation. When it is a small percentage of animal feed, growth is increased and internal methane reduced significantly (healthier livestock AND lower emissions!). As bedding (currently being used with pigs) it removes the odor and inhibits detrimental bacterial growth almost completely. In fact, he likes to bring folks to the pig pens to have a picnic! The bedding is then used to feed black soldier fly larvae, another beneficial species and passion of Paul's - highly nutritious and thrives on waste. Because of these properties, the Japanese agricultural product industry is buying up all available supply of good-quality biochar at a handsome price. This means that not only is the fuel free, but it creates a viable, sustainable source of income from what would otherwise be a waste product! Cana Little, of fi-lan-thro-pe, will demonstrate this machine around Southeast and South Asia as she visits coffee producer partners, while other project partners work on procuring USAID grants to produce these on a larger scale. The potential is huge, especially for coffee producers and processors (and possibly roasters), as dried coffee cherry is abundant, along with organic material collected from pruning. Used to fuel drying machines or even coffee roasters, this could close the waste circuit and reduce fuel costs significantly. With the right infrastructure, this could be used on a larger scale to produce emissions-free fuel for entire cities, all from waste. Cross your fingers and keep your eyes peeled for these technologies, as Paul isn't alone in these ventures. Gasifiers are becoming more popular and the confused stigma attached to biomass-as-fuel technologies subsides (there's a huge difference between simply burning biomass, which is terrible for the environment, and the gasification of biomass, which is emissions-free and actually sequesters carbon), gasification may necessarily become the fuel of the future (along with geothermal, wind and solar technologies, of course).